Max Holloway isn’t all that concerned with belts, although becoming a ‘champ-champ’ this weekend at UFC 236 would be a nice accolade to add to his resume. Ahead of his showdown with Dustin Poirier on Saturday night, Holloway has made it clear that the championship belts mean less to him that the legacy he’s creating with each passing victory against a long list of top ranked opponents. He already holds two wins over arguably the greatest featherweight in mixed martial arts history in Jose Aldo and if he can get past Poirier this weekend he will extend his winning streak to 14 while earning titles in two different divisions. Ultimately, Holloway says as nice as it will be to take home that second championship, the thing he wants most in the world right now is to become the No. 1 pound-for-pound fighter in the sport and he’s willing to do whatever it takes to get there. “The goal was to become the UFC champion and now the next goal is to be the No. 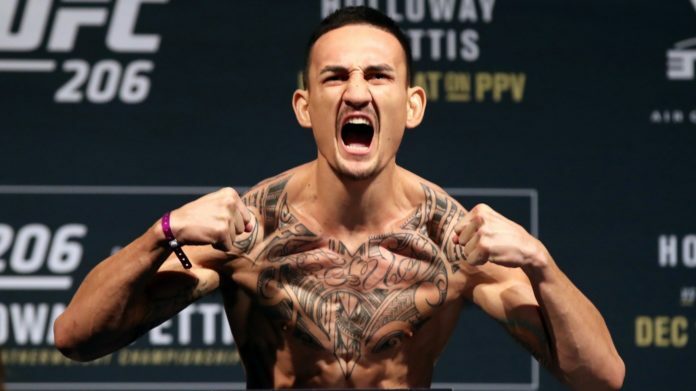 1 pound-for-pound fighter in the world,” Holloway said ahead of UFC 236. “Even if it’s Thanos or my friend DC (Daniel Cormier), he’s looking pretty dominant, at the end of the day if they’ve got to face me, they’re going to face me. I can’t wait. We live in exciting times. A lot has been made about Holloway’s opportunity to join a very elite club with a win over Poirier this weekend. If the 27-year old Hawaiian is able to capture a second world title he will join Conor McGregor, Daniel Cormier and Amanda Nunes as the only fighters to hold two UFC championships simultaneously. Of course, Holloway understands that he’s technically competing for an interim lightweight title this weekend but rather than letting that dampen his mood, he prefers to think of it as a chance to make his own mark in the history books. “It will make history. I’ll be the first champ—(I)champ, that’s history, baby,” Holloway said with a laugh. “The belt, it don’t matter to me. I don’t even know how much belts I have. I put them in the closet. That fighter he’s referencing is reigning UFC lightweight champion Khabib Nurmagomedov, who Holloway tried to face last March on one week’s notice before he was forced out of the contest due to concerns over his weight cut. Now Holloway stands one win away from another world title and an eventual showdown with Nurmagomedov later this year.